Tinctures in heraldry are the names given to the standard colours, metals and furs that cover the shield or flag. There are four main colours (black, red, blue and green). These are also known as sable, gules, azure and vert respectively. There are some less commonly used colours detailed below. A system of patterns was developed so that the tinctures could be shown without the use of the real colours. The patterns are shown below alongside the real colours. Select the colours, metals and furs on the right to see how they look on your shield. Once you are happy with the colour click the 'Save Changes' button and move on to the next page to see how the shield can be divided up. Field: The whole surface of the shield. 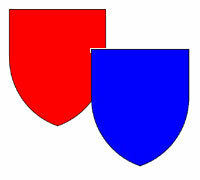 Charges: Bearings and emblems on the shield. These are divided into ordinaries and common charges. Ordinaries: The well-defined emblems with specific names and positions on the shield. Also includes sub-ordinaries. Common charges: All those emblems that are not covered by ordinaries. Tintures: The colours, metals and furs that cover the field. Blazon: The verbal or written description allowing the shield and surrounding parts to be reproduced.